A specialized version of PRIMS Hand Scaling Operations that has been optimized to meet the complexities our customers face when manufacturing desserts. Learn more about PRIMS Dessert here. Focus Works, a NY based provider of systems to the wholesale food and baking industry, has initiated a plan of significant investment in Blockchain technology for their PRIMS (Production Recipe Ingredient Management Software) software. Their PRIMS system has provided lot traceability long before the 2002 Bioterrorism Act or the implementation of the FSMA. Focus Works, a leader in food manufacturing and food safety software, is now leading the way towards the next technology in lot traceability. Simply stated, Blockchain is a technology where a group of distributed computing systems can compute the authenticity of a transaction in a non-centralized manner. The Blockchain is a distributed ledger where companies doing business with each other, such as growers, manufacturers, distributors and retailers, can record transactions securely. The database’s strength lies in its trustworthiness: the difficulty of reversing or changing what’s been recorded. The Blockchain database can also hold much more data than what retailers get today, providing tools for more detailed analysis. Retailers struggle to identify and remove food that’s been recalled. When a customer becomes ill, it can take days to identify the product, shipment and vendor. With blockchain, a retailer will be able to obtain crucial data from a single receipt, including suppliers, details on how and where food was grown and who inspected it within seconds. The database extends information from the pallet to the individual package. The current traceability standard of “one step forward, one step back”, as stated in the FSMA documentation, is not wholly suited for a global marketplace, and governments and retailers are demanding more. Handling all this information is a challenge for food producers of all sizes, around the world. Although the demand from large retailers for Blockchain lot traceability from all their suppliers may be some time away, Focus Works intends to have the technology available ahead of time for that demand. “We have always kept Focus Works at the forefront of new technology”, said Robert White, “and this is just one of the several new technology initiatives we are implementing this year”. “Companies wishing to do business with Wal-Mart, Costco, Nestle, Kroger and other large retailers will be left out if they cannot comply with this Blockchain requirement”, Mr. White says. “Combined with the fact that our PRIMS system can also operate the scaling, batching, production equipment and quality control on the plant floor, PRIMS offers the “Elements of Value” that food plants and bakeries are looking for”, says Robert White. Focus Works creates a mobile app so users can check on PRIMS production data remotely in real-time with their smart phone. It allows users to see production data in real-time from anywhere. PRIMS (Production Recipe Ingredient Management System) is a software-based automation solution that allows food processors to obtain superior product quality and radically reduce the cost of wasted raw materials. Focus Works has developed a PRIMS version for complex desert and cake manufacturers. It has advanced functionality and tools not available in other scaling, batching and manufacturing software for bakeries. The ability to handle multi-level sub-recipes (sub-components) each having different production time frames. Production scheduling that has unlimited number of days or months with a 21 day viewing window. Calculation of the raw material requirements based on work orders and open ingredient purchase orders for the schedule on a day to day basis. Instant visibility at a glance of any raw material shortages on the schedule. Change orders get handled automatically on the fly and adjustment of WIPs and raw materials are done automatically. Full accounts receivable with sales reporting. It allows for unlimited price lists, custom pricing by customer, discounts and promotional pricing, brokers and multiple customer’s companies. A huge variety of reports including; customer and product ranking, product cost and margins by product or customer. PRIMS can also handle your ingredient and batch lot tracking. Combined with the fact that this system can also operate the scaling, batching, production equipment and quality control on the plant floor, PRIMS offers the “Elements of Value” that bakeries are looking for. scaling, batching and greater functionality to grow the system should their business grow. Kellogg’s (which has chosen PRIMS as their standard manufacturing software). that bakeries are looking for. Focus Works will demonstrate its award-winning software at the upcoming 2016 International Baking Industry Expo (IBIE). Held October 8–11, 2016, at the Las Vegas Convention Center. IBIE is the largest and most comprehensive event for the baking industry with over 1000 exhibitors and over 20,000 attendees. Of our products on display will be SQF-Sentinel “paperless” food safety software. It has received the “2015 ASB Innovation Award” and at IBIE, the software will receive recognition as being a “2016 Becoming Environmentally Sustainable Together” (B.E.S.T.) product. The B.E.S.T. in Baking Awards recognize companies that supply products and/or services to the baking industry that help to decrease landfill waste, foster energy, conserve water, and reduce environmental impacts. SQF-Sentinel has not only reduced food safety labor and provided real-time verification but reduces the paper and toner for medium to large food plants $3,000 - $5,000 per year. 8/15/2016 - Focus Works announces a new software- Nutritional Analysis and Labeling Software called NutrAL. It is a tool for analyzing recipes or formulas for food cost and nutritional content. It is used to make the required Nutrition Facts and Ingredient Label Panels per both US and Canadian rules and especially to meet retail market's food labeling expectations. Required Nutrition Facts and Ingredient label panels are generated automatically from your recipes in both US and Canadian formats. 8/2/2016 - Focus Works develops a PLC communication driver to replace Rockwell’s RS Linx. Thus eliminating the cost and communication errors known to RSLinx. 3/8/2016 - Focus Works doubles its staff to handle increase in orders and larger customer base. 11/15/2015 - Kellogg’s selects Focus Works’ PRIMS software as their standard production control software with the order for the second plant to get PRIMS in Grand Rapids. They expect to roll out PRIMS in the rest of the 30 Kellogg’s plants. 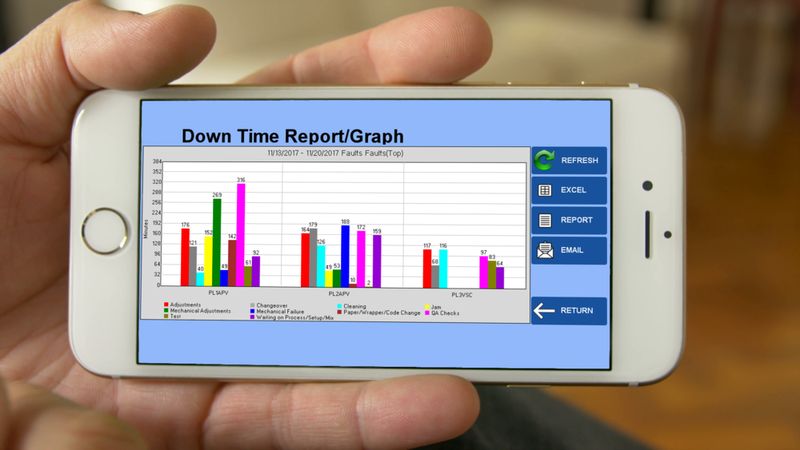 8/5/2015 - Focus develops its Efficiency Reporter software into a real-time OEE (Overall Equipment Efficiency) software called “The Scope.” It measures throughput, equipment uptime and downtime, and production efficiency and gives the plant real-time information. This paperless Food Safety Management System, SQF-Sentinel, eliminates pencil whipping, ensures the real-time collection of reliable food safety data, and reduces the manpower required for record keeping. This dynamic new software saves huge amounts of labor and insures accountability. Sentinel does the job without paper and is the solution for reliably collecting control point data for all food safety management programs [BRC, SQF & ISO]. It provides a real-time visualization and verification of safety tasks and operations. It alerts management of uncompleted QA & QC tasks and monitored process points such as freezer and cooler temps that are out of tolerance - via email and texts. Articles about Focus Works and our products have been published in a variety of trade publications. Click on the links below to see these stories.